Need a quick Brexit update? We have the answers to five questions you may have. How did this total mess come about? After two huge defeats for Theresa May’s draft EU-UK divorce deal, on January 15 and March 12, the speaker of the Westminster parliament intervened. He said there cannot be a third vote on the same thing during the current parliamentary term. Mrs May had hoped to re-run the vote before going to an important EU summit tomorrow in Brussels. The vote ban was a major blow. But it was not clear whether Mrs May had persuaded enough Brexiteers to change their minds and back her deal anyway. What does it all mean for Brexit? As things stand, Brexit will happen automatically – without a deal in nine days’ time on March 29. But some kind of extension is likely. 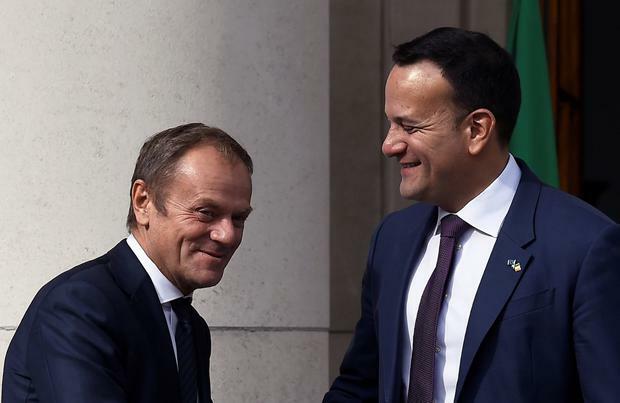 In the medium term, a no-deal Brexit, meaning economic calamity for Ireland, cannot be ruled out. We are in a period of huge UK political instability which can only get worse. Will the EU member states grant the UK an extension? EU governments are weary of UK dithering and all 27 must agree any extension unanimously. Nothing will be given easily. France and some inside the EU Commission feel a delay will only postpone the inevitable and that London only became serious when a deadline loomed. But ultimately, a delay will be seen as better than a crash-out by the EU’s second largest economy. The leaders may delay an extension decision until next week to see if Mrs May can overcome her technical problems and re-run that parliamentary vote. What length of Brexit extension is likely? Mrs May had been talking about three months until June 30, extendable if necessary up to two years. Reports from Downing Street this morning do indicate that Mrs May will request a short delay to Brexit in a letter to the European Union today. The bloc has said a request would need to be made ahead of tomorrow’s summit to allow the EU 27 to consider it. A short extension would give May breathing space to try and revive her deal, which has already been rejected twice by MPs. The EU has said a longer extension would require the UK to organise European Parliament elections on May 23. EU lawyers argue that if the UK is still in the EU, the parliament would require UK MEPs, so it can be lawfully constituted. Failure on that could mean all new EU laws would be invalid. Holding elections for an entity the UK is about to leave really sums up this total mess. But there are arguments for a long extension which would allow negotiations on a post-Brexit EU-UK trade deal. Yes. Mrs May could quit and the Conservatives would elect a new leader. There could be a general election – though it is not clear the rival Labour Party, which backs a soft Brexit, can win. Things might even drift to another referendum that might reverse Brexit. But public opinion is hugely divided on the prospect of another vote after three years of inconclusive wrangling.